This article is about the actress. For the international association football player, see Linda Hamilton (soccer). 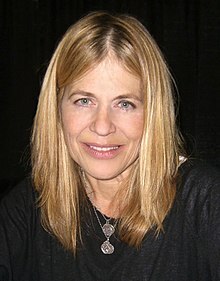 Linda Carroll Hamilton (born September 26, 1956) is an American actress best known for her portrayal of Sarah Connor in The Terminator film series and Catherine Chandler in the television series Beauty and the Beast (1987-1990), for which she was nominated for two Golden Globe Awards and an Emmy Award. She also starred as Vicky in the horror film Children of the Corn (1984). Hamilton had a recurring role as Mary Elizabeth Bartowski on NBC's Chuck. Hamilton was born in Salisbury, Maryland. Hamilton's father, Carroll Stanford Hamilton, a physician, died when she was five, and her mother later married a police chief. Hamilton has an identical twin sister (Leslie Hamilton Gearren), one older sister and one younger brother. She has said that she was raised in a very boring family, and "voraciously read books" during her spare time. Hamilton went to Wicomico Junior High (now Wicomico Middle School) and Wicomico High School in Salisbury, with Leslie, her twin. She studied for two years at Washington College in Chestertown, Maryland, before moving on to acting studies in New York City. Hamilton has said that her acting professor at Washington College told her she had no hope of earning a living as an actress. In New York, she attended acting workshops given by Lee Strasberg. Hamilton's acting debut came first on television, followed by a major role as Lisa Rogers in the prime-time soap opera Secrets of Midland Heights (December 1980/January 1981). Her big-screen debut was in the thriller TAG: The Assassination Game (1982) and as a result, she was listed as one of twelve "Promising New Actors of 1982" in John Willis' Screen World, Vol. 34. She also shared a starring role in the CBS made-for-TV movie Country Gold, with Loni Anderson and Earl Holliman. Hamilton played the lead role in Children of the Corn (1984), based on the horror short story by Stephen King. The movie, which made $14 million at the box office, was panned by critics. Hamilton's next role was in The Terminator (1984), opposite Michael Biehn. The movie was an unexpectedly huge commercial and critical success. Following The Terminator, Hamilton starred in Black Moon Rising, an action thriller with Tommy Lee Jones. She then returned to television as a guest-star in the mystery series Murder, She Wrote, scoring favorable reviews. Hamilton next starred opposite Ron Perlman in the television series Beauty and the Beast. The series was critically acclaimed, and she received Emmy Award and Golden Globe Award nominations. Hamilton left the series in 1989 and it ended in 1990. Hamilton returned to the big screen with Michael Caine in Mr. Destiny (1990) and with Terminator 2: Judgment Day (1991), the sequel to The Terminator. The latter was a smash at the box office, grossing over $500 million, more than any other film of that year. Hamilton underwent intense physical training to emphasize the character's transformation from the first film. Her identical twin sister was Linda's double in Terminator 2. Hamilton received two MTV Movie Awards for her role in the film, one for Best Female Performance and the other for Most Desirable Female. She reprised the character, Sarah Connor, for the theme park attraction T2 3-D. In 1990, Hamilton was chosen by People Magazine as one of the 50 Most Beautiful People in the world. Following the success of the Terminator series, she hosted Saturday Night Live. She returned to television in A Mother's Prayer (1995) playing a mother who lost her husband and is diagnosed with AIDS. For her performance in the film, which co-starred Kate Nelligan and Bruce Dern, Hamilton was awarded a CableACE Award for best dramatic performance and nominated for another Golden Globe Award in 1996. That same year, Hamilton filmed two motion pictures that were released one week apart in 1997: Shadow Conspiracy with Charlie Sheen and Dante's Peak with Pierce Brosnan. Shadow Conspiracy flopped at the box office, but Dante's Peak grossed $180 million and was one of the biggest commercial hits of the year. She received a Blockbuster Entertainment Award for female performance in Dante's Peak. Hamilton has since appeared on the television series Frasier (season 4 episode "Odd Man Out" as Laura) and According to Jim and has done more TV movies, including On the Line, Robots Rising, Rescuers: Stories of Courage: Two Couples, Point Last Seen and The Color of Courage. Hamilton and her Beauty and the Beast co-star Ron Perlman reunited in the post-Vietnam war drama Missing in America (2005). In 2009, she returned as Sarah Connor in Terminator Salvation, in voice-overs only. In 2010, she joined the cast of Chuck in the recurring guest role of Mary Elizabeth Bartowski, a CIA agent and long-missing mother of Chuck and Ellie. She also appeared as a guest star in the Showtime cable television series Weeds as the marijuana supplier for the series' main character (Mary-Louise Parker). In November 2011, she narrated the Chiller The Future of Fear horror documentary. More recently, Hamilton has had a prominent guest role on Lost Girl and a prominent recurring guest role on Defiance. Hamilton has been married and divorced twice. Her first marriage, from 1982 to 1989, was to Bruce Abbott, who left her when she was pregnant with their son Dalton. In 1991, she moved in with film director James Cameron following his divorce from Kathryn Bigelow. They had a daughter, Josephine, born on February 15, 1993. She and Cameron married in 1997, but the marriage was short-lived, ending in a $50 million divorce settlement in 1999. Hamilton has described herself politically as a Democrat, but she voted for Republican candidate Arnold Schwarzenegger, her Terminator co-star, in the 2003 California gubernatorial election after his campaign convinced her he was suitable for the job. In an October 2005 appearance on Larry King Live, Hamilton discussed her depression and her bipolar disorder, which led to violent mood swings and suicidal thoughts during her marriage to Abbott, and ultimately destroyed both of her marriages. She also discussed how she eventually received therapy and medication to manage the condition. While filming Terminator 2: Judgment Day, Hamilton suffered permanent hearing damage in one ear when she fired a gun inside an elevator without using her ear plugs. 1980 Shirley Gloria Episode: "Teddy Roosevelt Slept Here"
1986 Murder, She Wrote Carol McDermott Episode: "Menace, Anyone?" 1991 Saturday Night Live Host Episode: "Linda Hamilton/Mariah Carey"
1997 Frasier Laura Episode: "Odd Man Out"
1998 The New Batman Adventures Susan Voice role in one episode: "Chemistry"
1999 Batman Beyond Dr. Stephanie Lake Voice role in one episode: "Meltdown"
2005 According to Jim Melissa Evans Episode: "Lean on Me"
^ "Linda Hamilton Biography (1956–)". Film Reference. Retrieved November 14, 2010. ^ a b Pfefferman, Naomi (May 16, 2002). "The 'Jewish' Side of Linda Hamilton". The Jewish Journal of Greater Los Angeles. ^ "Philadelphia Inquirer: Search Results". nl.newsbank.com. Retrieved December 1, 2015. ^ "Linda Hamilton biography". biography.com. Retrieved October 6, 2013. ^ " Children of the Corn (1984)". Box Office Mojo. Retrieved October 4, 2012. ^ "Children of the Corn (1984)". Rotten Tomatoes. Retrieved October 4, 2012. ^ "The Terminator – Box Office Data". The Numbers. Retrieved September 19, 2010. ^ "The Top Movies, Weekend of November 9, 1984". The Numbers. Retrieved September 19, 2010. ^ "'The Terminator' surprises the critics; is a top grosser". Tri City Herald. November 30, 1984. Retrieved September 19, 2010. ^ "Making of Terminator 2". Empire Magazine. September 1991. Retrieved June 5, 2014. ^ Hibberd, James (July 24, 2010). "Linda Hamilton joins 'Chuck'". The Hollywood Reporter. Archived from the original on 2010-08-26. Retrieved July 25, 2010. ^ "Linda Hamilton Returns to 'Chuck' for the Series Finale". Archived from the original on 22 April 2016. Retrieved 26 March 2016. ^ "The Future of Fear" Archived 2012-01-15 at the Wayback Machine. Chiller TV. Retrieved January 1, 2012. ^ a b "CNN Larry King Live Interview with Linda Hamilton (transcript)". CNN.com. 2005-10-14. Retrieved January 2, 2008. ^ a b Sewards, Lisa (February 5, 2011). "My Rollercoaster Marriage To The Crazy Genius Behind Avatar". Daily Mail. ^ "Forbes: Michael Jordan's Divorce Most Costly Ever". Fox News. 2007-04-16. Retrieved December 15, 2008. ^ "Linda Hamilton: 'I Voted for Scwarzenegger'". starpulse.com. 2007-07-24. Retrieved August 30, 2010. ^ Julius, Marshall. "Linda Hamilton : Interview". Blockbuster LLC. Archived from the original on 2012-10-25. Retrieved 2016-03-03. To this day I have serious hearing loss in one ear. We were shooting a scene in an elevator and I'd forgotten to put my earplugs in. ^ "Garage Sale Finds: What was on TV November 20th through 26th, 1982 (TV Guide Magazine reproduction)". GarageSalin. Retrieved March 19, 2015. ^ "Awards for Linda Hamilton". imdb. Retrieved October 6, 2013. Wikimedia Commons has media related to Linda Hamilton.